Tape has been the medium of choice for backup and archive in enterprise organizations for more than half a century. This isn’t surprising, as magnetic tape has been at the forefront of data storage technology for the past few decades. But, now the cloud has begun to offer more compelling solutions and the opportunity to use cloud archiving services and to dispense with traditional in-house technology. 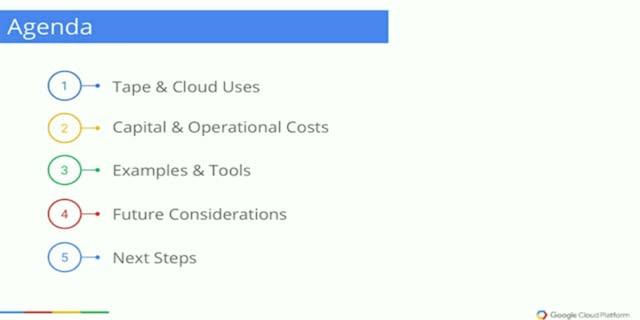 Having worked as a Backup Admin and used both tape and cloud storage, Dave Elliot, Product Lead for Google Cloud Storage, is going to provide a truthful comparison on the costs of tape versus cloud. - Is cloud backup right for organizations with low internet bandwidth? We all know that data is growing at a really fast rate for a variety of reasons. At the same time, budgets for storing and protecting that growing data are not changing, or not as quickly as the data is growing. The classic ‘do-more-with-less’ drumbeat in IT continues. With tape as the primary backup target, companies are facing many limitations which are becoming more and more problematic in a world where data security, compliance, and availability are critical. Hear from Dave Elliot (Google) and Randy Serafini (Veritas) as they discuss about cloud storage, backup, and some of key aspects of making the decisions on moving to the cloud as a backup destination.